[Faith] is a light coming from the past, the light of the foundational memory of the life of Jesus which revealed his perfectly trustworthy love, a love capable of triumphing over death... faith is also a light coming from the future and opening before us vast horizons which guide us beyond our isolated selves towards the breadth of communion (LF 4). Faith illumines our lives as it informs our lives with the memory of Jesus' life and it illumines the path in our journey to the vast horizons where we are called to be and discover God's presence. As I noted in another blog entry, we are all called to the horizons of our times – the frontiers of new and developing technologies, eco-sustainability, complex migration policies and patterns, and globalization. We also called to frontiers of our human experience. Faith sheds lights on and strengthens us on that journey as it reminds us of Jesus' promise: “I am with you always, even unto the end of the world” (Mt 28:20). The Eternal Word is ever present in our pilgrimage to the vast horizons where we seek to bring and to find God. It is a journey beyond our isolation into the fullness of communion and transformation. In that journey, we allow the Word made Flesh to take flesh in us, to speak life to all peoples and all nations. It is in this odyssey that we grasp the breadth, the length, the height and the width of Christ's love (Eph 3:18-19) for us and for the world. We go to the vast horizons, to the frontiers of our time and our world, as witnesses of God's love. We testify to Love not just as those who remember a historical event, but as women and men who have been touched and transformed by Love. We join those in the frontiers who “cannot bear the mystery of God's hiddenness, who cannot endure the time of waiting to see Jesus' face” (LF 13), as reminders that together we are God's very presence in the world, and companions in the awesome vocation of seeking God in all things. 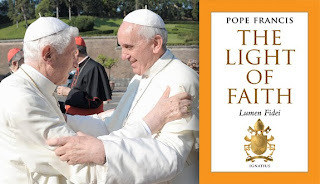 Faith is then both the light that illumines our paths and our response to God's action in our lives as we choose “to enter into the horizons opened up by God's word” (LF 9). Our faith is a response to a Word, who engages us personally. It is an act of remembrance that moves us into the corners of our time and our world to seek partners and companions there where God already is and where he invites us to discover him. Faith, as an act of remembrance, becomes capable of opening up the future. Lumen Fidei shows how faith as memoria futuri, remembrance of the future, is at the very core of our human vocation. Faith is the assurance of things hoped for (Heb 11:1), our contemplation of the mysteries and promises given to us in Christ, and also our “participation in [Jesus'] way of seeing” (LF 18). Assured and strengthened by Jesus' action in our lives, are we ready to journey with him to the vast horizons of our world?